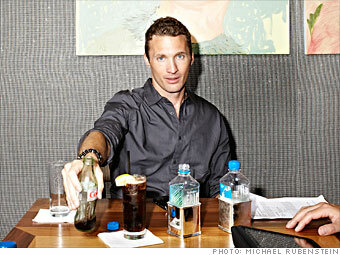 The CEO of health and nutrition company ViSalus Sciences beats a posh path when he travels. Blair pauses at the Core Club in New York City. His story reads right out of a Hollywood script: Misguided kid from a broken home falls in with a gang, spends time in and out of juvenile detention, is taken under the wing of a mentor who sets him on the right path and ignites an entrepreneurial spirit that sees the boy become a multimillionaire. His health and wellness company keeps Blair, 34, hopscotching the country 25 days a month, but he found time to author Nothing to Lose, Everything to Gain, in which he shares insights gleaned from a difficult childhood that are applicable to business (as in, "If you let someone take your milk the first day, they'll start taking it every day"). We caught up with him at home in L.A. where he gave us a few of his survival skills. How the Accel Partners executive keeps her cool on two coasts.